The posters had accused Samarian Regional Brigade Commander of 'shooting at Jews'. 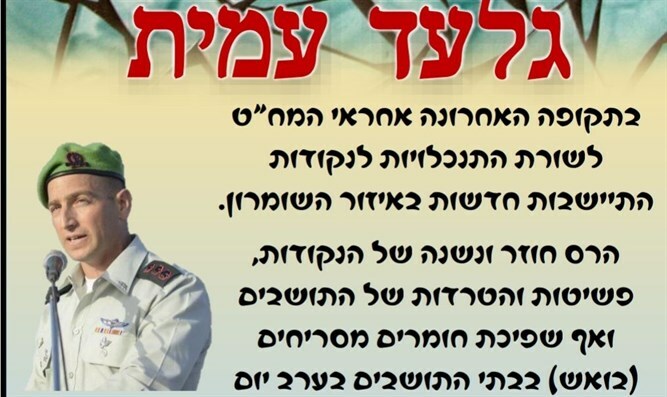 Four right-wing Israelis were arrested by police on Thursday after they hung leaflets around Judea and Samaria hitchhiking stops that criticised Samaria Regional Brigade Commander Colonel Gilad Amit. The flyers accused Amit of "shooting at Jewish people" and decried his "harassment of the settlement movement". The four are charged with insulting a public servant and will be brought before a judge on Thursday. The Honenu legal organization, which is representing the four, decried the arrests, contending that police had detained their clients in order to censor them. "As the Supreme Court has ruled in the past, these are not crimes and definitely not crimes that warrant an arrest," said Attorney Nati Rom. The four had hung up flyers after an attempted evacuation of an outpost near Itamar in Samaria on Saturday turned violent. Soldiers had reacted with tear gas and riot control measures and fired into the air after allegedly being attacked by rioters. Three suspects were arrested and taken for questioning by the Israel Police after the incident. The face-off had enraged activists in Judea and Samaria, who alleged that Colonel Gilad Amit had ordered troops to shoot at outpost residents. "They shot at us right above our heads; one of the guys had to duck so the shots wouldn't hit him, and the soldiers shouted and cursed us horribly.The Border Police came and broke our belongings and equipment, and took our water and food. We've come to settle the Land of Israel so with G-d's help another settlement will be established here. The army's conduct won't break us," said one of the activists.